When that final school bell rings for the day most students are out the door – unless you happen to be a student in Martha (Marti) Pulido's engineering class at Ross Collins Career and Technical Center. Rob Smith, CTE director at Ross Collins, describes Pulido as someone who has the ability to teach the content and prepare for "real life." She is someone who could easily double or triple her salary as an engineer, but her heart is in providing opportunities for students, he said. It is a unique situation when the administrator has to encourage the teacher to "slow down." It is also necessary to tell students to leave, so the building can be secured in the afternoons. "Many of them can't get enough during the regular instructional day so they come back after school," Smith said. "That tells me students really enjoy her as a teacher and can't get enough of good instruction. It is also a reflection of the great relationships that are established." Devontae Hunter, who is a second-year student of Pulido's, said he is one of those students who stay after the last bell rings. "We stay after school, and come on Saturday's to work on different projects for competition," Hunter said. "She pushes us to our limit sometime – which is good, and helps us choose a career." Under the guise of "National CTE Month," Pulido was surprised to learn she had been chosen as February's Golden Apple winner at an assembly with 85 students witnessing the presentation. An industrial engineer by degree, Pulido said after working in the industry for 15 years she decided she wanted to teach to make a difference in another way. "When I first started teaching here two years ago I was just going to ease into the first year, really get my feet wet and figure out what I was doing the same time I was teaching them," Pulido said. 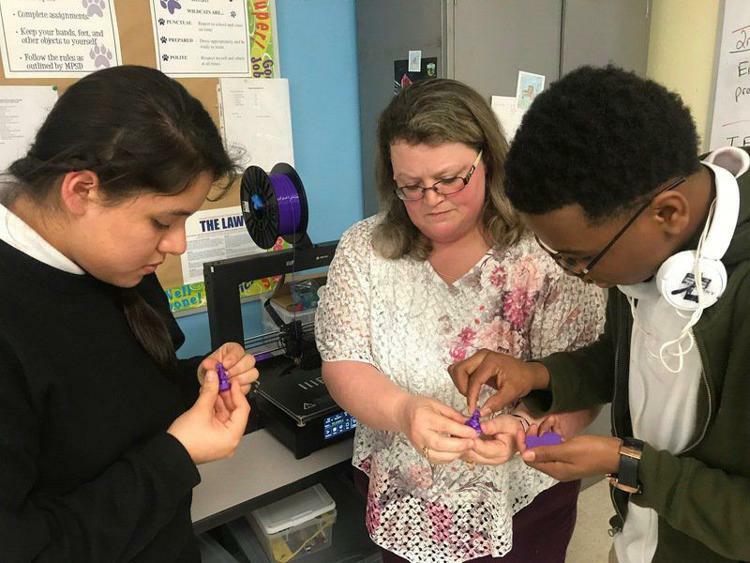 "But, I had a student who came up to me and wanted to do robotics, so we began an extracurricular robotics club." The first year the students placed in the top five in the state and competed in the southeastern regionals. "We built the robotics from parts we were given," Pulido said. "That was probably the most exciting to win fifth in the state. We have also done underwater robotics and non-robotic things like bridge building. They are all engineering projects, just different facets, because not every student is going to be excited about robotics. "You have to have some other ideas. To see them come in after school and work on a project I didn't assign is so fulfilling to me as a teacher. It's usually the same techniques we have talked about in class, but they are applying the techniques to something that wasn't an assigned work. Freshman Eric Franklin said Pulido makes classes fun. "Instead of being bored in class, just sitting here wondering what I am doing with my life, or what I am going to have for dinner, she puts things in perspective for me," Franklin said. "That makes me happy." Up next for Pulido's class – a Haas machine that will cut metal. 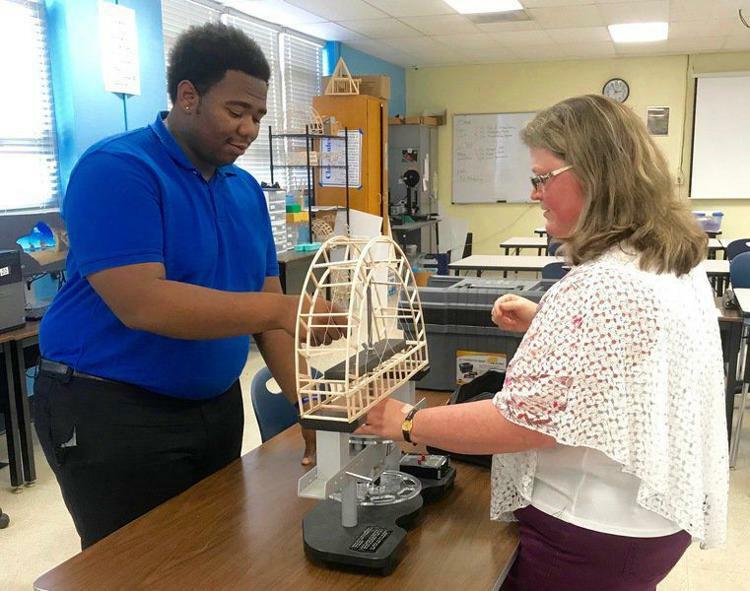 Ross Collins Career and Technical student Devontae Hunter, left, is shown calibrating the bridge builder with help from engineering teacher Martha (Marti) Pulido. "We are really excited about learning how to operate the machine – learning how to program," Pulido said. "One of the biggest things we have heard while touring different facilities around Meridian is having someone that knows how to program when they come out of school. That is one thing I teach them – how to read a program, develop their own program, to apply it and actually have a finished part come out of the machine. "This is a machine where they draw their own parts in CAD, and it will generate a code and modify if needed. The machine will actually produce the part." Pulido said one of the things she wants her students to take away from her class – that they always have a voice, and can do more than they think they can. Find out what drives them, and what they are here for. What excites them, and start building on that. "They really need to look inside of themselves and see what excites them, inspires them, and what gives them passion," Pulido said. "Pursue that and don't let anything stop them."